Hair removal isn’t easy. It is a lot more difficult to achieve beautiful, hairless skin than most people care to admit. Through trial and error, everyone needs to find which hair removal technique is right for them. Along this path, many unnecessary mistakes are made. However, these mistakes are avoidable! 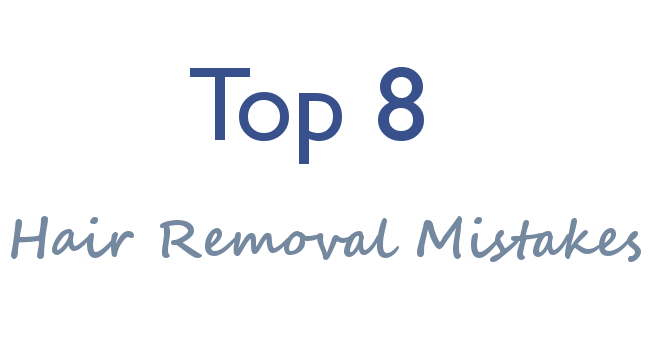 Hopefully this list will save you from making some common and painful hair removal errors. Getting a little tweezer happy is a common problem for many people. The impulse to avoid bushy eyebrows often leads to action without a plan. This can result in hair being removed in the wrong places, destroying the shape of the eyebrows. Repeated heavy tweezings can even damage your hair follicles so much that they may not grow back. If you are going to tweeze your eyebrows, err on the side of caution and be sure that you have a plan. Better yet, look into trying Threading for perfect brows every time. Exfoliation leads to the removal of dead skin cells that have built up on the surface of your skin. Removing these dead skin cells is a way of “buffering” and shining the skin by revealing the healthier, fresher layer underneath. This results in better access to the hair during your hair removal procedure. In short, exfoliation will lead to closer hair removal, fewer ingrown hairs, and healthier looking skin. This is a huge mistake that happens far too often. We may think that shaving with soap or just water will not be damaging to the skin and will yield similar results to shaving cream; but this is simply incorrect. Be prepared to deal with irritation, razor burn, and ingrown hairs if you choose this route. Shaving cream is specifically designed to hydrate your skin and to provide protection while shaving to avoid irritation. You have a much better chance at ending up with soft and smooth skin if you use shaving cream. For people who are not germ-aphobes, sharing a razor seems like a great idea. Why go out and buy an overpriced razor when you can simply borrow your boyfriend’s or roommate’s? Here’s why: because you can put yourself at risk for a follicle infection! In addition, sharing razors can spread nightmare conditions like herpes and warts. You may trust that the person you are sharing a razor with doesn’t have these conditions, but what is the point of taking the risk? Sometimes it’s hard to get rid of a razor. Whether it is just laziness, unwillingness to buy a new razor, or wanting to scrape every last use from your current razor; most razors find a way to stick around for far too long. Using dull or worn out blades is a sure way to end up with irritated skin and ingrown hairs. On top of that, bacteria collect on razors over time and can put you at risk for an infection if you cut yourself while shaving. If you must use an old razor, soak it in rubbing alcohol before shaving to kill potential bacteria. Do it at home waxing will save you some money, but it may cost you a lot of pain and irritation. Waxing is a practice that takes skill and training. You cannot expect to see great results unless you have put the time and effort into learning techniques and researching different types of waxes. Many people nonchalantly give waxing a try and it leads to dire results. Infections, bruised skin, and ingrown hairs can all result from improper waxing. If you think waxing is the right hair removal strategy for you, consider hiring a professional. Exposing your skin to the sun up to 24 hours before and after waxing is a bad plan. If you tan before waxing you are making your skin more sensitive and thick, which could make you end up with a lousy wax. Tanning after waxing can lead to burns, irritation, and inflammation. It is always a great idea to keep your skin moisturized, especially after shaving. However, you need to be sure you apply the right moisturizer or aftershave. Do not apply fragranced moisturizers after shaving as they can lead to a burning sensation and can cause an allergic reaction. Cheap aftershaves are also not recommended because they can further dry out your skin due to the alcohol they contain to fight bacteria. It is best to find a hydrating aftershave/moisturizer that is free of fragrance to remoisturize your skin and prevent ingrown hairs and irritation. How many of these mistakes have you made? Are there any good stories you would like to share?